Bicycles provide both essential commuter and recreational transportation in Lawrence and Douglas County. As a recognized Bicycle Friendly Community, the City of Lawrence is working on enhancing existing facilities while planning for the future needs of bicyclists. The Lawrence and Countywide Bikeway Plan update will reconcile the various bicycle related plans (the Lawrence Pedestrian Bike Issues Task Force, the Lawrence Loop Alignment Study, the Lawrence Bike Parking and Amenities Policy Review with Citywide and Downtown Recommendations, annual bicycle and pedestrian counts, Bicycle Friendly Community feedback and the most recent Countywide Bikeway System Plan) into one vision for the future of bikeway infrastructure in Lawrence-Douglas County. The purpose of this plan is to develop a low-stress bicycle network that can make bicycling an attractive choice for transportation. There were multiple ways to provide your input. Members of the Bicycle Advisory Committee (BAC) were at the events. Special Accommodations: Please notify the Lawrence-Douglas County Metropolitan Planning Organization (L-DC MPO) at (785) 832-3150 at least 72 hours in advance if you require special accommodations to attend this meeting (i.e., qualified interpreter, large print, reader, hearing assistance). We will make every effort to meet reasonable requests. The BAC is guiding the development of this plan. To view their agendas click here. May is Bicycle Month and in 2018, Bike to Work Week will be May 14-18 and Bike to Work Day will be Friday, May 18. 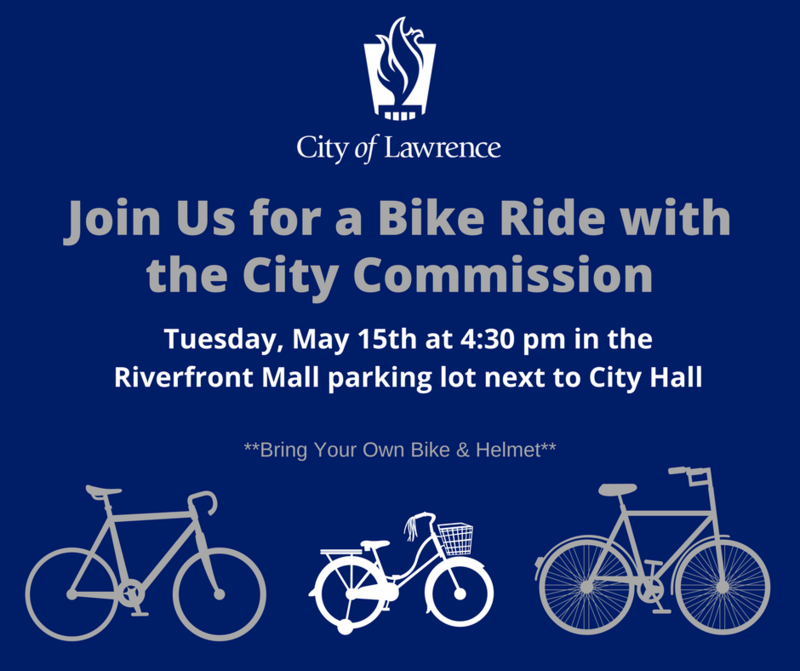 The City of Lawrence would like to encourage all residents to experience the benefits of bicycling to work during this time and reminds bicyclists and motorists to safely share the road. Executive Summary – Countywide Bikeway System Plan This study was completed as a part of the Multimodal Planning Studies. The new Plan replaces the 2004 Bicycle Work Program. The bicycle rideability map is designed to promote, encourage and educate bicyclists. The map assists riders in choosing routes most applicable to their skill level, alerts them to difficult intersections, shows major landmarks to help bicyclists navigate around town and identifies transit connections. View a version of the map here. On March 26, 2015, a Road Safety Assessment (RAS) was conducted for the 19th Street Corridor from Barker to Iowa. The RSA is part of a U.S. DOT initiative to reduce bicycle & pedestrian injuries and by helping communities built streets that are safer for people walking, bicycling, and taking public transportation. Read the report. The inventory considers guidelines for bicycle parking and types of bicycle parking facilities available in Downtown Lawrence. It includes a location map and list of the available parking by type and makes BAC recommendations for bicycle parking improvements. Read the report. In 2012, the City of Lawrence was re-designated at the Bronze level and the League of American Bicyclists provided feedback and suggestions to further promote bicycling in Lawrence. In 2016, the City of Lawrence was re-designated at the Bronze level and the League of American Bicyclists provided a Report Card. Every year the City of Lawrence works to improve the conditions of cycling and vehicular transportation. Part of the City’s charge is to educate motorists and cyclists on the best ways to share the road. Sharing the road means that drivers and cyclists work together to improve road safety through shared awareness, patience, courtesy and cooperation. Join us for a series of Association of Pedestrian and Bicycle Professionals webinars on topics of interest. The webinars are hosted by the Lawrence-Douglas County Metropolitan Planning Organization and can only be viewed on-site. Visit https://lawrenceks.org/lprd/bike for information about bike repair stand locations, reporting bike repair stand damage, and educational links. Do you have a question or concern about area bicycling ? Is a trail blocked due to construction? Have you had a pleasurable ride recently? Use our feedback page to notify City officials about your concerns.